As part of your application for RN Licensure, the State Board of Nursing (for the state through which you are seeking licensure) must receive an official transcript from the University of Wyoming reflecting receipt of the BSN degree. The Registrar’s Office will not release transcripts if you have any outstanding holds with the university. Please be sure that you have cleared all holds with the university. 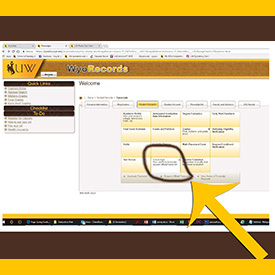 Access your account information through WyoWeb or contact Accounts Receivable, (307) 766-6232, to verify whether you have any active holds on your records. If your transcript is not released you will be unable to sit for the NCLEX exam until the State Board of Nursing has received the transcript. The Wyoming State Board does not require a separate official notification of graduation from the Fay W. Whitney School of Nursing (FWWSON). They just need your official transcript from the Registrar’s Office documenting granting of your BSN degree to include with your application materials.